Personal Breeze was made by Alon Kadury, Eyal Gruss, Omri Shacham and Adi Grossman in GeekCon 2008. The purpose of all GeekCon projects is a non-practical project, that will be fun to do. On a hot day, when you return home and start the air condition or a fan, you want to stand in front of it and cool down. However most of the times you find yourself moving around the room doing other things. Personal breeze project tries to solve the conflict between staying in front of the fan or moving around. 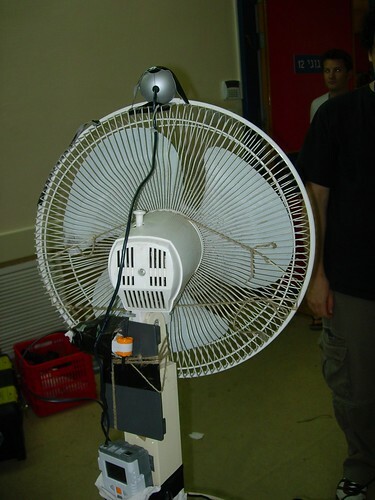 We've placed a webcam on a fan. Skin detection algorithms written in Matlab identified your position relative to the camera. Accordingly commands are send from the Matlab program to a WCF service, which host an NXT brick that controls a servo motor. The motor turns the fan so that you will be placed in the center of the fan all the time. DeBurger was made by Alon Kadury and Elad Shapira in GeekCon 2009. The purpose of all GeekCon projects is a non-practical project, that will be fun to do. It is a known fact that being in shape increases productivity. Programmers often work long hours, being stationary and operating only fingers and mouth muscles (eating). As a result programmers are likely to be out of shape. This causes companies to face a dilemma, should I send my programmers to the gym to improve their health (thus increasing productivity), but lose precious work time? DeBurger tries to come up with a solution in which the programming process will be more physical. If we cause the programming process to be more physical, developers will get into shape without leaving the keyboard. 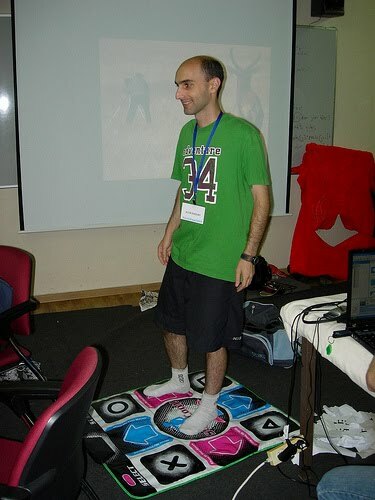 This is done by creating an interface between a Dance Dance Revolution (DDR) and Microsoft Visual Studio. This interface allows developers to operate some of the Visual Studio functionality by stepping, jumping and moving on the DDR. The following projects were done by Alon Kadury and Dr. Valid Talis in GeekCon 2010. The purpose of all GeekCon projects is a non-practical project, that will be fun to do. In this project tried to find a solution to one of the oldest problems females faced from the beginning of time – how to make husbands do house work. Knowing what drives males is easy. Trying to simulate geek female thoughts is much harder. We began our journey with one thing we found in common – love for Wii and ended up integrating a broom to a PC. In the counter project (how to make the wife leave the PC), we used a TV remote control and Arduino to activate applications and simulate keystrokes. This is also good for games which require unique keyboard combinations. At the end of the project we used the TV remote as a keyboard extender to unique key combinations (e.g. Ctrl + Alf + F7).